We've owned chickens for 4 years and have come a long way. We certainly were novices when we started out. Even the basic information on what to feed them was foreign to us. Fortunately, our local Atwoods store, where we bought our first chicks, makes things easy for new chicken owners by providing a basic starter kit that includes a little feeder, waterer, heat lamp and a bag of chick feed. So, home we came with our new babies and got them all set up to start life in grand style. Reality, however, set in a few weeks later when they outgrew their brooder and we had to improvise a bigger pen for them until we could get their permanent home ready. By the time we got their coop ready, they were looking more like mature chickens than baby chicks, and we realized we could not feed them chick feed forever. So, back to Atwoods we went to look at the alternatives. As it turns, out there are a variety of poultry feeds and it can be somewhat confusing. So, here's the low-down on what we have learned. Below is a picture of the kinds of feeds we currently have on hand. The bowl on the left contains an all purpose "growth" formula. It contains high protein and can be fed to all poultry regardless of their age. The middle bowl contains "layer" formula. It is lower in protein, but high in calcium and is meant for mature hens who are actively laying eggs. The calcium helps make the eggshells strong. Layer formula should not be fed to young chickens, as they are actively growing and need more protein than it contains. When introducing young chickens who are not as yet laying (these are called pullets) into a flock of older hens, you can feed the entire flock the growth formula until the pullets begin to lay eggs. Then, switch them all over to layer formula. It is a good idea to put out some calcium in the form of ground up oyster shells while you have the flock on growth formula to give the laying hens the calcium they need for strong eggshells. The last bowl contains "scratch" feed. This is a mixture of several grains, such as cracked corn and millet. It should only be used as a treat because it does not contain enough protein. I keep it in a kitty litter bucket in the shed next to their coop and give them a couple of handfuls each day. They have learned to recognize that bucket and get all excited when I bring it out. Once the bucket is open, they can hardly wait to get at it. I normally just throw the scratch feed out on the ground and let them peck it up off the ground. They love it. I had a brilliant idea last week. 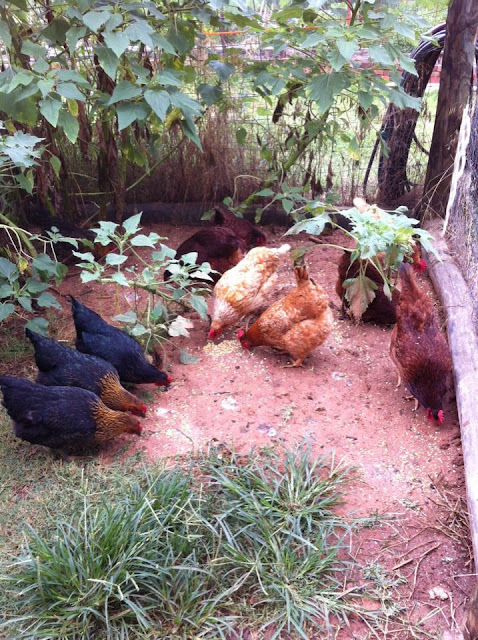 It involved devising a way to make our chicken coop a little more organized. First of all, our chicken coop is very small, just 6 feet by 11 feet. Inside the coop we have 3 nest boxes and the waterer on one of the long sides, 2 roost bars along short end opposite the door and the feeder opposite the nest boxes. So, it is pretty crowded in there. I like to provide the girls with grit and a calcium source. The grit helps them digest their food and the calcium helps keep their eggshells strong. The calcium source is either oyster shell or crushed up eggshells. Until last week, I put the grit and calcium source in clay flower pot saucers which I set on the coop floor. The drawback to this is the chickens either scratch out the contents, or they step on the saucers, turn them over and spill most of the contents. Last week I was trying to figure out a way to keep the saucers from turning over. I tried setting a brick on them. This kept the saucers from being upended, but the chickens still scratched the contents out onto the floor. So, I was thinking if perhaps I built a low shelf up off the floor, then it might keep them from scratching the grit and calcium out. One idea led to another and here is what I came up with. This shelf is just big enough to hold 2 saucers. They are held in place by a couple of "hooks" made from 2X4 pieces. Here's a closer look at how the hooks work. The saucer lip fits under the hook to keep it from being tipped over and the shelf is low enough the chickens have no trouble reaching the saucers. Also, being up off the floor keeps the contents from being scratched out, as well as keeps the saucers from picking up debris from the floor. This was a simple project using materials we already had on-hand and it does not take up much space in our already crowded coop. However, I have to admit that I only came up with the idea, but enlisted Tom's help with cutting the board and hooks. I'm a little squeamish about using power saws. They give me the creeps. But, don't you agree it was a brilliant idea! I am a dedicated fan of the program Oklahoma Gardening on our local PBS station OETA. In fact, ninety percent of the programs I watch are on that station, but that is beside the point. A few months ago, I watched a segment where they were using "Smart Pots". These are produced by an Oklahoma wholesale company. Here's a link to their website. These are soft-sided fabric containers that can be used to grow a wide range of fruits, vegetables and ornamental plants. Technically, they are called "aeration bags". The cloth provides aeration to the roots to encourage healthy growth. I decided to give these a try and ordered two of them. Here is one of them filled with potting soil. The fabric sides encourage roots to "air prune" or branch when they encounter the edge of the container. This prevents roots from circling around the container. The smart pot stays cooler than many other containers because it is breathable and able to release heat through the fabric. Smart Pots are being extensively used by a Canadian non-profit organization that spreads awareness of urban agriculture. One of their prominent demonstration sites is located at Quebec’s National Assembly. This site showcases edible gardens in 200 square feet of bed space using Smart Pots. I planted a parsley plant in one of the pots I purchased. I have trouble getting parsley to produce well in our hot Oklahoma summers. I'm hoping that using this Smart Pot will help with that.